To take your learners on an actual field trip, can be logistically challenging but at the same time very rewarding. It is advisable to take them somewhere close to the school that is easily accessible and safe. The venue should also lend itself to lots of learning opportunities. Make sure that tablet use are seamlessly incorporated (e.g. using QR codes, videos, photos, etc). For this badge, you may work with a colleague(s) from other subject(s) area(s), but you have to create at least some (minimum 5) of the questions yourself, that will be relevant to your subject. 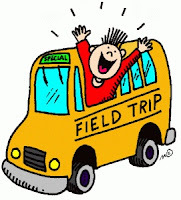 Apart from handing in the entire Field trip activity worksheet, you must mark which questions you contributed! 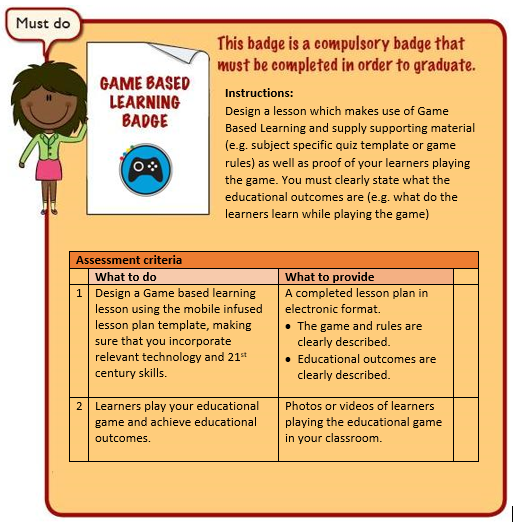 So what do you need to do to get the Game Based Learning Badge?? You need to create a lesson where you will use educational game(s) for your learners to play and achieve your learning outcomes. The place to start is as always with: "What do I want my learners to learn?" (your lesson outcomes). You can then go and investigate what educational apps and tools are available that can be used in your lesson to achieve the learning outcomes. As our "lesson" session topic was "Copyright", we used a quiz to make sure that all the learning is centred around that topic. Dividing the learners into groups, where each member has to research a section of the work, also resulted in every group member taking responsibility for their learning and contribution to the communal group's quiz knowledge. You can make use of the Quiz slideshow template in your resource folder to create your own class quiz (goo.gl/gdtQCC ) by replacing the markers with your own questions and answers. You can use the online Quiz maker called Flipquiz (Flipquiz.me) to create your quiz as it keeps track of the teams, categories and scoring for your. One of my favourites is Kahoot. it is easy to use and really gives creating games a whole new dimension which the learners love!! You can create flashcards and use the app Quizlet (see previous blogpost) to re-enforce the gaming topics and to create an automated drag and drop time based game! Remember, any quizlet, flipquiz or slideshow quiz you create for your students can count towards your Content creator badge as long as it is a "freestanding" learning object. In other words, it covers a curriculum subject topic that can be used by another teacher anywhere! There are many gaming apps for almost any educational topic. As long as it support or extend your learning outcomes, you are welcome to use it. Remember to upload your lesson plan and your learner photos to our shared Google drive folder. If you have any questions, feel free to contact Maggie or leave a message below. During this module the teachers will experience a Gallery walk as a teaching strategy, engage in a real and virtual gallery walk while becoming more aware of issues regarding online identity and safety. They will also build an effective personal and professional learning community. In this exercise we will use the blog post comments as a backchannel. Just click on the comments link at the bottom to reply to this discussion. What is the exhibit about? Describe how it makes you feel. 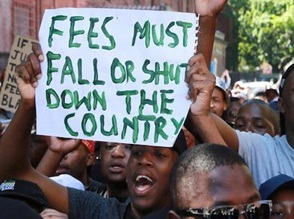 Do you think that #feesmustfall? Reply to at least one other person in the discussion thread, opposing their opinion. 2. Scan the QR code of the exhibit using your Quickmark app. Does the video portray the situation fairly? 3. What format was more effective, the video or the photo? Was this exhibit a well chosen example? 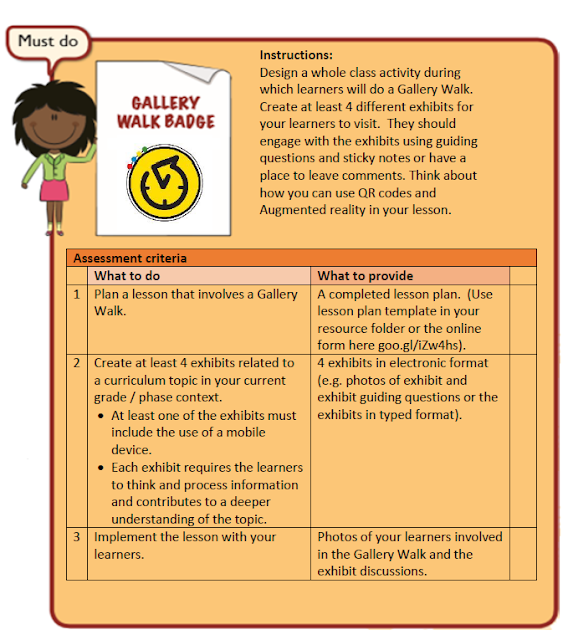 The Gallery walk strategy is different from the Learning Stations strategy in as far as it is more suited to discussion and discourse. Even though it can also be places where you can learn and gather information about a topic, it should entice discussion. So were do your start??? Your your subject CAPS topic of course!! Make sure that they learn something new at each exhibit. Create clear guiding questions that will solicit good discussions. They then have to make a comment and discuss the other learners comments well. A good idea is for them to put their names on the stickies so that when you take it off the wall, you have a recordal of participation. Do a debrief, get the learners to summarise all the exhibits as an individual activity. A great idea is to get the learners to create the gallery walk exhibits on different topics that you give them, They then put their Exhibits up and the other groups critique it. A list of South African Online communities of practice. If you know of any that should be listed here, please add as a comment. Assess the other team's flipped lesson plans. 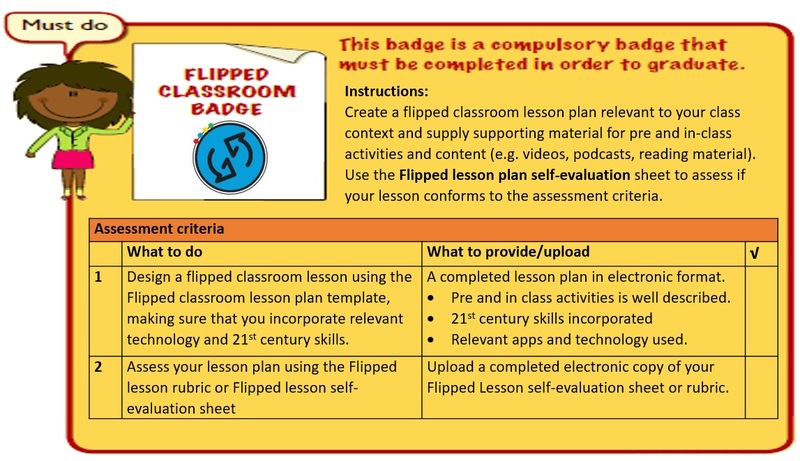 Create a flipped lesson plan for your class. Create or download the content that you want them to work through (relating to your curriculum subject content) to be able to do their "homework" in the class with your help. Give the learners their "homework" activity to do in the class in groups or pairs so that they can help one another. Assist them if they have hassles. How do you earn the badge? To earn this badge, you need to design a flipped lesson plan. There are amazing scavenger hunt and virtual field trip tools and apps available nowadays that can be used in and out of the the classroom. Of course, as always, you will need internet access if you want to use the apps out of the classroom in a non connected environment. It makes creating scavenger hunts easy as pie!! Actionbound is an app for playing digitally interactive scavenger hunts to lead the learner on a path of discovery. These multimedia based rallys are called 'Bounds'. The program quite literally augments our reality by enhancing peoples’ real-life interaction whilst using their smartphones and tablets. You can create a digital timeline of events or a places of interest tour, with the use of GPS coordinates and pre-placed codes and mysteries. It can be used for ice-breaking exercises, historical or archaeological sites, or more simply presenting a vision for the future. 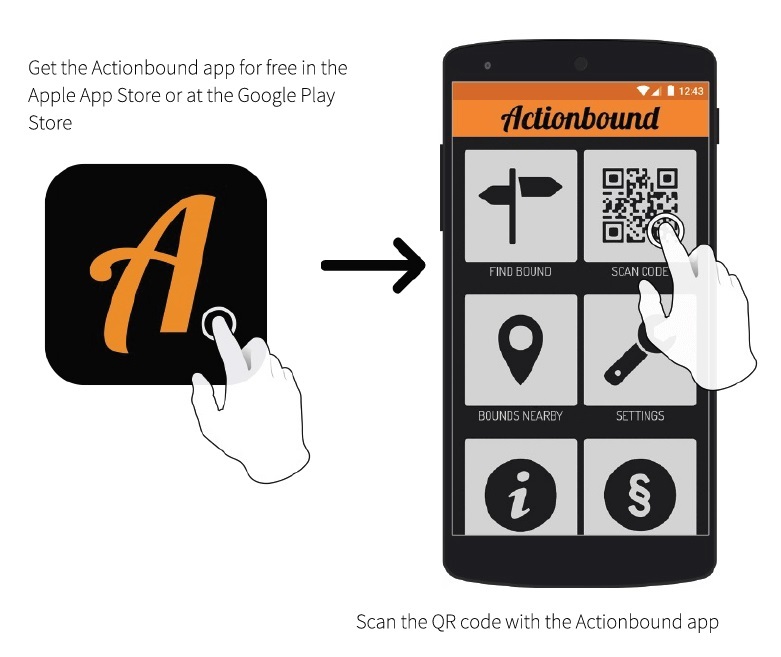 It offers gamification elements with tools like GPS locations, directions, maps, compass, pictures, videos, quizzes, missions, tournaments, QR codes and much more to create fun and exciting mobile app-based adventures. 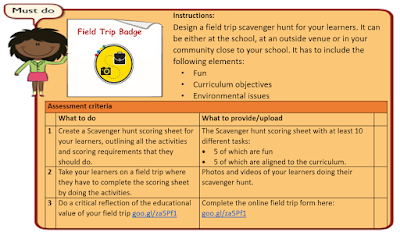 Create missions using text, GPS log-ins, video and pictures to create your scavenger hunt.